1. "I believe that the next half century will determine if we will advance the cause of Christian civilization or revert to the horrors of brutal paganism." 2. "Education is useless without the Bible." 3. "Let every Student be plainly instructed, and earnestly pressed to consider well, the maine end of his life and studies is, to know God and Jesus Christ which is eternal life." 4. "To suppose that the eye with all its inimitable contrivances ... could have been formed by natural selections, seems, I freely confess, absurd in the highest degree." 5. "Nonviolence is the answer to the crucial political and moral questions of our time; the need for man to overcome oppression and violence without resorting to oppression and violence." 6. "Whoever shall introduce into public affairs the principles of primitive Christianity will change the face of the world." 7. "If we ever forget that we are One Nation Under God, then we will be a Nation gone under." These astounding quotes are only a few of the thousands in America's God And Country Encyclopedia Of Quotations. 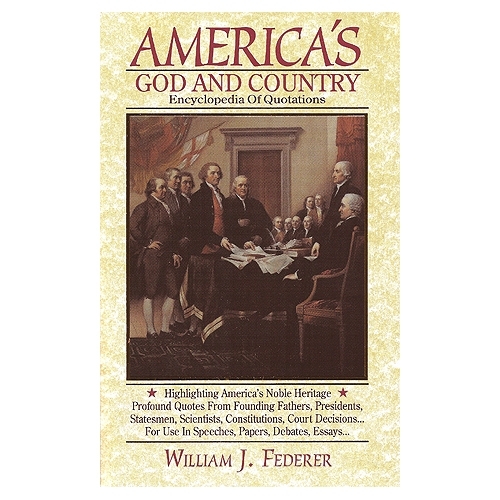 This comprehensive 845-page reference tool includes over 2,100 quotations from nearly 700 sources highlighting America's noble heritage. Complete with footnotes and illustrations, this book is a valuable resource to individuals in any occupation or endeavor.